Microsoft Account (previously known as Windows Live ID) is a single sign-on solution provided by Microsoft that covers a wide range of services. Since Windows 8, users are urged to enhance their Windows sign-on experience by adding Microsoft Account credentials to their local account. Once a Windows 8, 8.1 or Windows 10 user uses their Microsoft Account credentials to sign into Windows, they automatically gain access to a range of cloud backup and synchronization options via Microsoft OneDrive. Logging in with Microsoft Account requires using email and password (as opposed to username and password used for local Windows accounts). username@live.com, username@hotmail.com and username@outlook.com can be used as Microsoft Account logins. Importantly, Microsoft Account is used as a single sign-on solution for a number of Microsoft services such as Hotmail, OneDrive, Skype, and employed by many third-party service providers authenticating via Microsoft Account. So let’s see what all this means in practice. 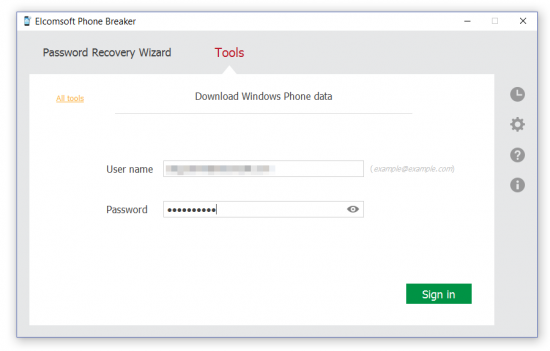 BitLocker encryption is secure. Full-disk encryption is activated automatically on devices equipped with TPM once the administrative user logs in with their Microsoft Account (yes, logging in with a Microsoft Account is a required pre-requisite for triggering automatic full-disk encryption on many tablets and ultrabooks). Breaking into a system like that would be extremely hard. Even running a cold-boot attack is not feasible as tablets have soldered memory chips that do not allow for this type of attacks. However, Windows automatically creates BitLocker escrow keys, and automatically deposits them into the user’s Microsoft Account. 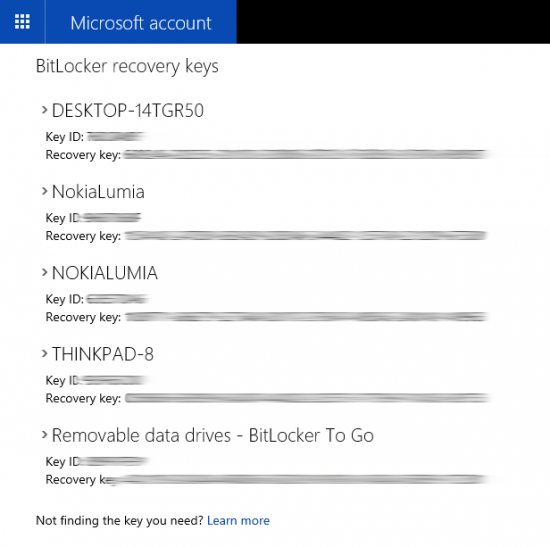 Once you know the account password, you can access all BitLocker Recovery Keys from that account. 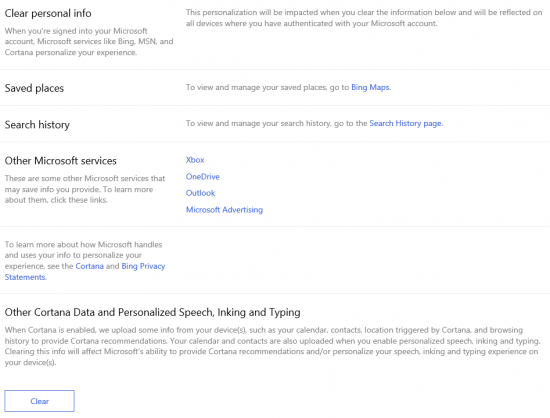 We’re greeted with a notice that “When you’re signed into your Microsoft account, Microsoft services like Bing, MSN, and Cortana personalize your experience.” Which means that Microsoft collects some data, and that we could possibly access that data by logging in with the correct authentication credentials. Using Microsoft Account on a Windows 8, 8.1 and Windows 10 PC allows users to access one of the best cloud backup systems for personal computers. Microsoft OneDrive is pre-installed with those versions of Windows, and is automatically authenticated with Microsoft Account credentials once the user signs in. 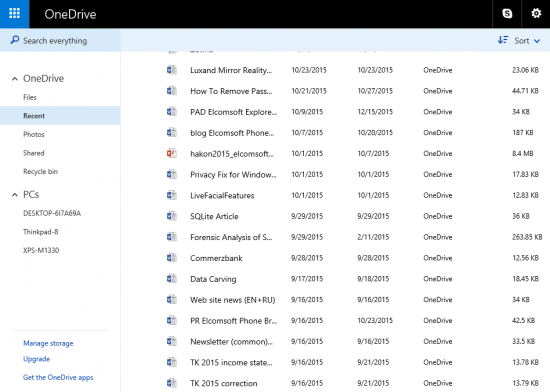 OneDrive automatically backs up any files (such as Office documents, pictures etc.) that are saved into its folder. Moreover, since Office 2013, users are encouraged to save their files to the cloud. Finally, it is possible to configure OneDrive to replace the default Documents location, in which case ANY file or document saved to that location will be automatically backed into the user’s OneDrive account. OneDrive is extremely convenient. All that’s needed to gain access to the most recent copies of work documents on a new computer (running Windows 8, 8.1 or 10) is simply signing in with a Microsoft Account. Windows will automatically configure the desktop and sync everything stored in the user’s OneDrive account, including documents, settings etc. OneDrive is not limited to just Windows computers. 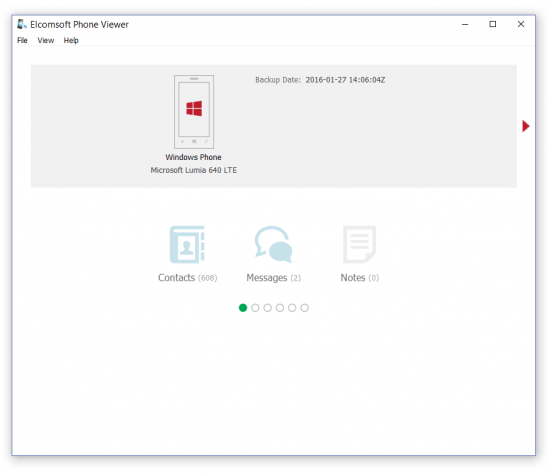 Android and iOS users can install OneDrive to enable automatic photo backup, while Windows Phone and Windows 10 Mobile have OneDrive pre-installed and pre-configured. 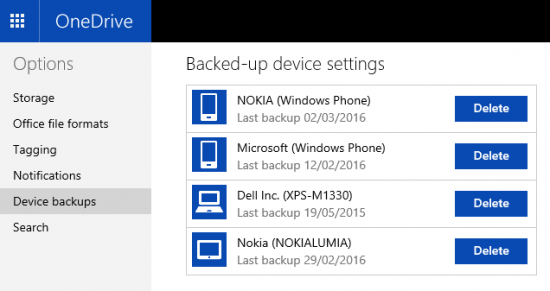 Accessing OneDrive also gives access to synced information from other devices. In an attempt to compete with Google, Microsoft introduced Bing, its very own search engine. In the US, Microsoft pays users for searching with Bing (via the Bing Rewards program). Bing is the default search engine in Internet Explorer (Windows 8, 8.1) and Edge (Windows 10) Web browsers. 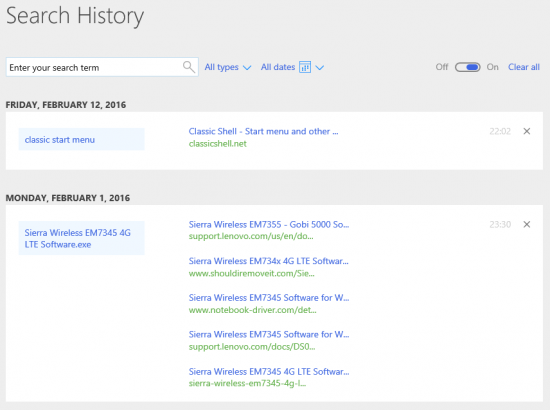 Obviously, Bing is also the default on Windows Phone and Windows 10 Mobile devices. 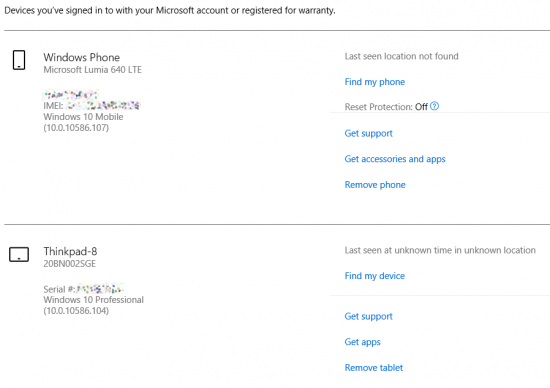 One more thing that experts can do with Microsoft Account credentials is disabling Find My Phone and Reset Protection (account.microsoft.com/devices) functions of a Windows 10 Mobile device (that may come handy to help prevent suspects from remotely wiping seized smartphones). 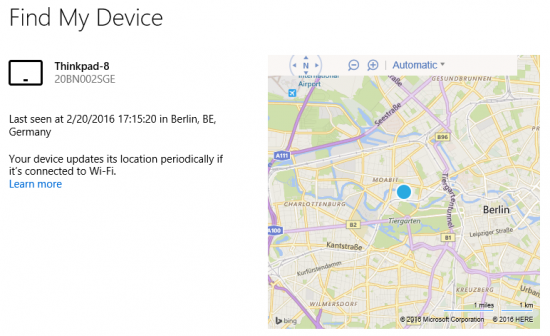 One can also use “Find My Device” to discover the last location of the device. If enabled, two-factor authentication is a real roadblock to accessing cloud data even after recovering the correct password. Since forensic acquisition is normally performed on what’s considered to be a “new device”, the authentication system (if activated) will require verifying user’s identity with the second authentication factor. As such, one will need to have access to the secondary authentication factor in order to be able to authorize with Microsoft services. So what is this “secondary authentication factor” we’ve been talking about? Let’s first see how two-factor authentication works in Microsoft Accounts. 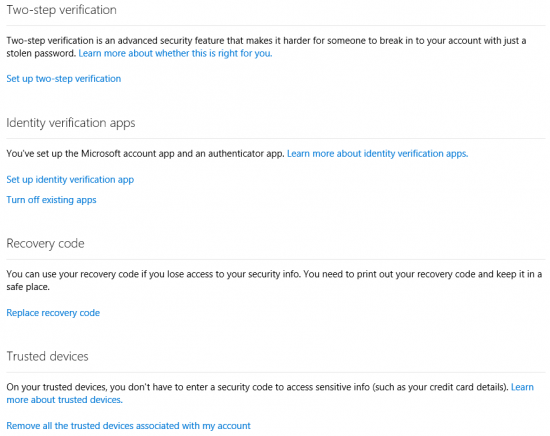 Microsoft Account logins can be protected with two-factor authentication. Two-factor authentication can be used to protect access to Microsoft’s online services when such access is requested from a new device. Microsoft uses a hybrid approach to two-factor authentication. The user can verify their identity by either approving the online verification request on a trusted device (this requires running the Microsoft Account app on an Android device), or by entering a code generated by the offline Authenticator app. The verification request can be pushed to an authorized Microsoft Account app running on a trusted PC or mobile device (again, the app is only available for Android devices). Once the request is approved with an app, the new device is added to the list of trusted devices. Other platforms (Windows Phone 8 and 8.1, Windows 10 Mobile, iOS) can use either Microsoft Authenticator or Google Authenticator app for generating time-sensitive single-use codes. Interestingly, Microsoft’s and Google’s authentication apps are fully compatible to the point of being interchangeable, so one can use Google Authenticator on an Android device to generate offline authentication codes as well. The difference between the two types of authentication is that the former requires an active Internet connection to receive authentication request, while the latter works completely offline. Both authentication methods can be active at the same time. Microsoft allows using two-factor authentication to either protect all interactions with Microsoft Account. However, the user can choose to only enable this type of authentication for accessing sensitive information such as establishing Microsoft Account on a new Windows 10 device (which automatically enables full access to all files synced via Microsoft OneDrive, access to stored passwords, and the ability to restore backups including configuration settings and application data). Microsoft Account passwords are not normally stored anywhere on the computer. As a result, simply extracting the password is not possible. 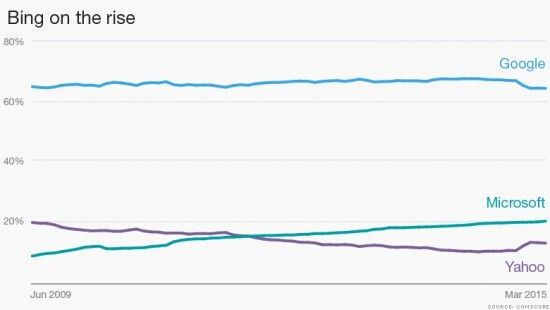 However, in order to facilitate logins in the absence of network connectivity, Microsoft had to cache a password hash and store it on the computer. On the one hand, this allows users to log in to their computer while using it offline. On another hand, this also allows extracting the cached hash file and running an offline attack to recover the original password. As you can see, recovering Microsoft Account passwords is a two-step process. During the first step, you will be extracting the password hash (and attempting a range of quick attacks to try some of the most common passwords). If the first step does not reveal the original password, you will need to attack the password offline using one or more computers equipped with GPU units. These attacks are straightforward and very well optimized, allowing to enumerate password combinations extremely quickly. 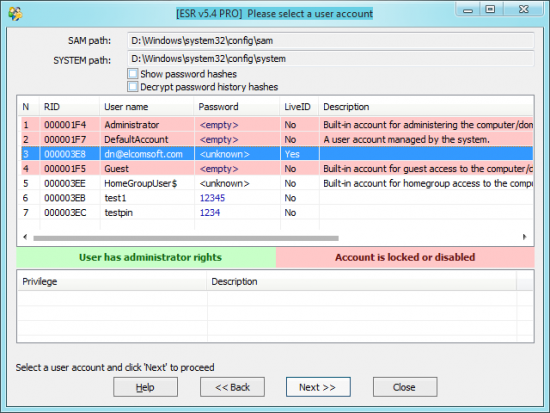 Once Elcomsoft Distributed Password Recovery discovers the correct password, you can use it for logging in to the user’s online Microsoft Account. As opposed to local Windows accounts, Microsoft Account credentials are stored remotely on Microsoft servers, and are authenticated online. Running a full-scale attack on a Microsoft Account password online is impossible. However, since Internet connectivity may not be always available to the user, a local copy of the password hash is stored locally to provide offline authentication. 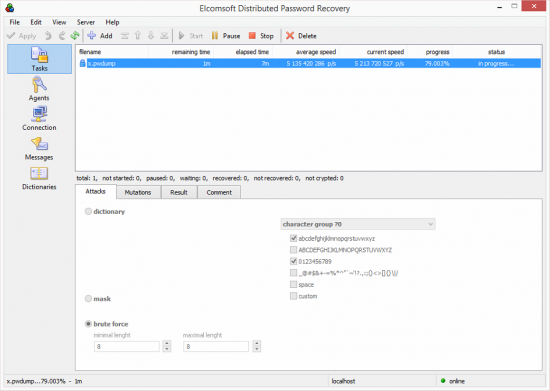 Elcomsoft System Recovery makes use of the local cache to extract password hashes, enabling experts to run a GPU-accelerated attack (with Elcomsoft Distributed Password Recovery) to recover the original password. With the original Microsoft Account password in hands, experts can access many types of data from the user’s online account. This entry was posted on Friday, March 18th, 2016 at 2:08 pm	and is filed under Did you know that...?, Elcom-News, Security, Software, Tips & Tricks. You can follow any responses to this entry through the RSS 2.0 feed. Both comments and pings are currently closed. Good job the americans say! Thank you! 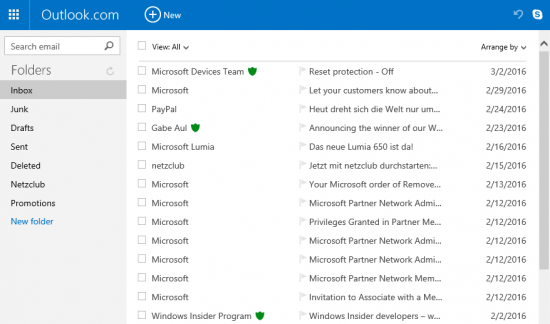 Background: My hotmail account recently got hacked. I have been using google authenticator for 2 factor authentication this account. I also have two app passwords for my Mac email and my iPhone email. Microsoft says that I owned a Windows PC which uses this account (I may have bought it, set it up, and returned it without deleting all information). Someone from Vietnam performed a successful sync using Exchange ActiveSync to my account on October 7th. At that time, my iPhone mail said that it could not access my hotmail account and asked for my password again. I entered it but did not change it. Next, someone from Indonesia signed in to my account on October 19th. 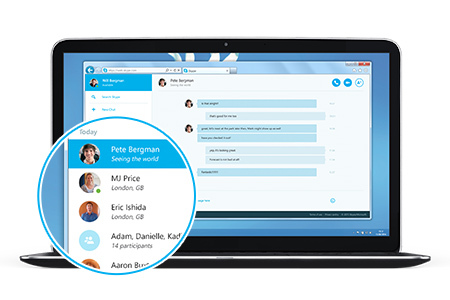 They used the alias which is used only for skype. I had a skype account that was created independently of the hotmail account and somehow Microsoft has linked the two. I have since reset my password and deleted the Windows device. I have also removed all “trusted devices”. Microsoft says they cannot figure out how this happened. They seem to think it is user error. It is not. How did the first sync occur. Is that my stealing my app password from my iPhone or mac? 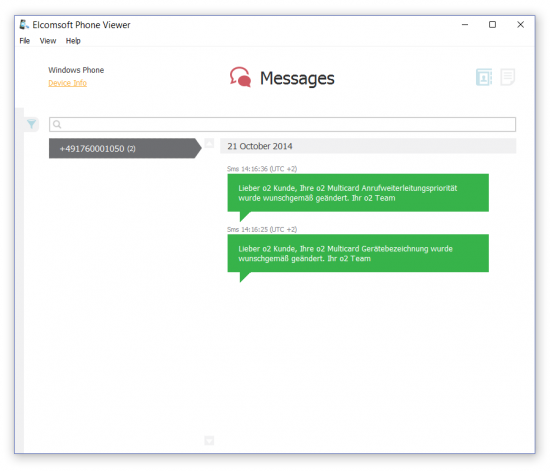 Is there a mechanism to break into a hotmail account using a less secure skype alias? How do I report this to Microsoft and Google so that I get their attention? Would be nice if could use a hardware security key to log in to my Microsoft account like I can with my Google account? We evaluated Google Authenticator a little bit but have not found any weaknesses so far. Even more, the Google token is pinned to the specific device and can be extracted/decrypted only with physical acquisition (and only from jailbroken 32-bit device, so up to iPhone 5/5C). So the only vector of attack I can think of is obtaining app password from your Mac (which is in fact also not very easy, until you saved it in a plain text and so it became accessible to some malware). Answering your other question — I do not think it is possible to compromise Microsoft Account through Skype, at least I never heard of that. Finally — yes, an ability to use the hardware key for accessing Microsoft account would be nice! Thanks for the detailed reply. As you noted, Microsoft did not/could not help.